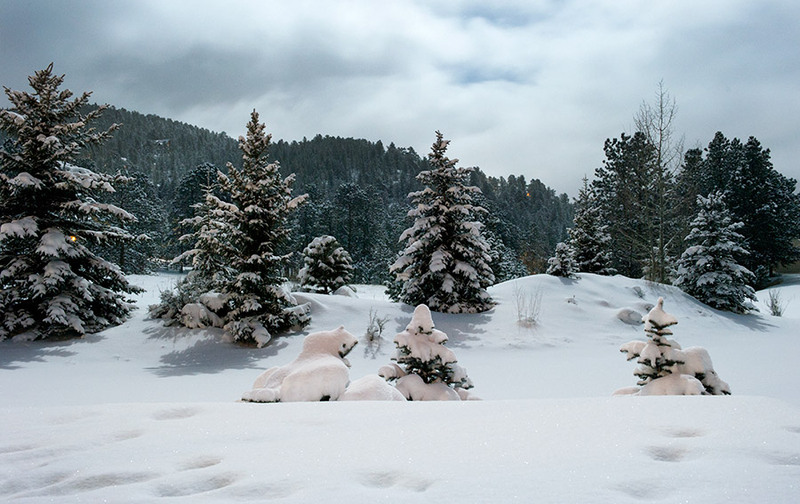 Clouds began to separate late last night after a significant winter storm rushed through Colorado leaving close to twenty inches of gorgeous powder here in Evergreen. When I looked outside around 10 p.m. there was a stunning bluish glow bathing our new blanket of snowfall. It was hard to resist not taking a photo. Every time I see a scene like this I am always reminded of an image I have had embedded in my mind for years. Ray Atkeson, a renown Pacific northwest photographer, took one of the most beautiful moonlit winter photographs I have ever seen. It is this tranquil image of the Timberline Lodge on Mt. Hood taken in 1949. Long ago I relinquished the thought of ever outdoing Atkeson. First, the snowfalls in that region of the Cascades are monumental. Or at least the snowfalls used to be of that reputable variety. Secondly, lodge settings like Timberline hardly exist anymore. I will say however, there’s still plenty of backcountry to snoop around to surprise ones’ self to moonlit beauty.